From the on-going brilliance of artists from The Lands, in the far north of South Australia, to the delightful evolution of the soft sculpture coming out of Larapinta Valley town camp in Alice Springs and the many shades of achievement in between, Desert Mob shows once again that the drive to creativity amongst Aborigines of the desert is unabated. The exhibition, in its 21st year, keeps with its firmly established tradition of huge diversity: dazzling paintings of the highest order, drawing on ancient sacred traditions and knowledge, alongside naive works that charm with their view of contemporary Aboriginal life; fine art alongside crafts; refined crafts alongside those more simply, even crudely yet expressively fashioned. Singular visions claim their space: amongst the offerings from Ernabella Arts, there is nothing that resembling the palimpsest-style work of Dickie Minyintiri; from Tjala Arts (in Amata, SA), Tiger Palpajta’s Wanampi Tjukurpa stands out for its wonderfully free way with paint; from Ninuku Arts (at Kalka, SA), Sandy Brumby’s work sings off the wall, on a note all its own; with fine array of works from Tjungu Palya (Nyapari, SA) each is impressively distinct, in content and aesthetic. There is a strong sense in these high order works of lives lived long, richly and deeply. Elsewhere there is delight, playfulness and affection: Marlene Rubuntja’s character-filled Mother and babies, Rhonda Sharpe’s finely stitched Beautiful Bird in Flight (both from Yarrenyty Arltere in Larapinta Valley camp); the Hermannsburg Potters’ fond evocations of country music; Greenbush Art Group’s menagerie, fashioned from found objects such as car mufflers; Eunice Porter’s and Jean Burke’s commemorations of contemporary events at Warakurna; Lance James’ lively brumbies and Kukula McDonald’s “big mob” of red-tailed black cockatoos (both from Bindi Inc). From some art centres there is reiteration of achievement, such as in the showing of small works from Papunya Tula (for whom the main game at the moment is no doubt the major retrospective opening at the National Gallery of Victoria at the end of the month). Everywhere there is this persistent message: this is something we do, this is something we love and are proud of. Desert Mob is no longer just an exhibition. It is also a day-long symposium as well as a marketplace for lower-priced works and in both, many artists and their families play hands-on roles. However, the exhibition on opening night is the big event and more effort could be made to involve the artists personally in it. The opening crowd heard from chairperson of Desart, Jane Young (Tangentyere Artists), speaking assertively about the importance of art centres as Aboriginal places, but no other artist spoke. The opening the night before at RAFT Artspace, of two shows from Tjungu Palya, showed how effectively this can be done. Artists and family members spoke from their heart in their language about the life and work of Jimmy Baker, to whom one show was a tribute. Skillful translation was provided by Diana James. The things that might not make it into a catalogue entry got expressed, that he was a good painter and a good fencer, for example. We learned that at first he didn’t want to paint, knowing nothing about it, but that he learned quickly to paint wonderfully, while the work of other family members was not very good for quite a long time – this said with laughter. Audience response to Aboriginal art is fed in part by their desire for contact with Aboriginal people and an event like the opening of Desert Mob can and should provide this, shifting the emphasis away from the frisson of big spending. This being said, the financial return to artists and art centres is part of the affirmation of the value placed by others in what they do and this year’s opening night sales exceeded last year’s by some $10,000: $332,175 compared to $322,147. However, the rest of the weekend did not add a great deal more: this year’s total was $354,850, while at the end of the first weekend last year sales were a little higher at $363,286. As of today (Tuesday), 137 works out of 294 have been sold (46%). 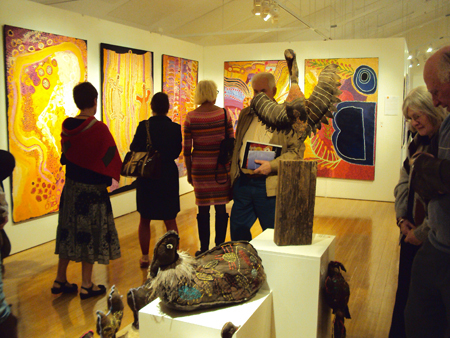 There were 600 visitors to opening night and over 2000 came through the Araluen galleries the next day. Around 2000 visitors attended the marketplace on Saturday, which had lifted the price ceiling of works to $500 and asked for extended trading hours. A major public art institution acquired the work by Telstra-winner Dickie Minyintiri; the Ngaanyatjara Council acquired to works reflecting the celebrations of their 30th anniversary; and Araluen, as always added to its collection. It acquired a major work by Nellie Stewart from Tjungu Palya; a jewel-like canvas by Carol Maanyatja Golding from Warakurna; two ceramic pieces – a vessel by Renita Stanley from Ernabella, a sculptural piece by Rona Rubuntja from Hermannsburg Potters; and two found object sculptures by Kevin Dixon from Greenbush Art Group (based at the Alice Springs Correctional Centre). Desert Mob is produced in partnership by the Araluen Arts Centre, the advocacy body Desart and its member art centres. Shows until October 23. Opening night (above): The soft sculptures of the Larapinta Valley town camp artists were much admired. In the background are the dazzling paintings from Tjala Arts, based at Amata in the APY Lands. Slideshow: Wanampi Tjukurpa by Tiger Palpatja • Wati Wilu-Ku Inma Tjukurpa by Dickie Minyintiri • Soft sculptures by Yarrenyty Arltere artists • Hermannsburg Potters celebrate country music • Bush Pig by a Greenbush artist • Ngaanyatjarra Council’s 30th Birthday Party by Jean Yinalanka Burke • Malilanya, ceramic by Renita Stanley • Walu by Carol Maanyatja Golding • Images courtesy Araluen, the artists and the art centres.